or theft, GAP is designed to cancel the difference between what you owe on your loan and the amount paid by your primary auto insurer. Now you also get Deductible Assistance with your purchase of GAP. deductible is incurred. This means you’ll have one less expense you may have to worry about if something happens to your vehicle. 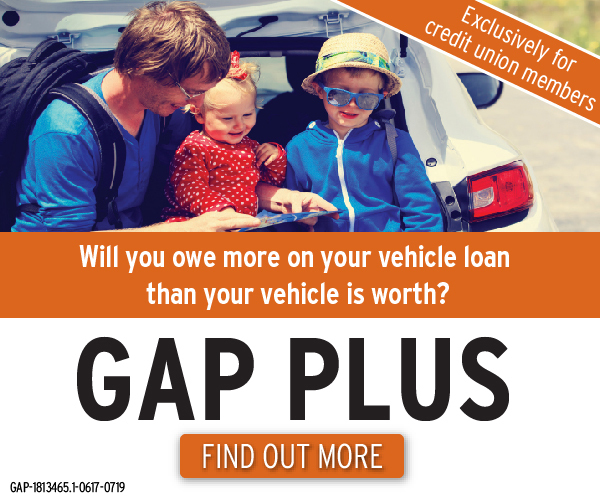 Call us today to learn more about how you can add GAP with Deductible Assistance to your vehicle loan. is optional and will not affect your application for credit or the terms of any credit agreement you have with Us. Certain eligibility requirements, conditions, and exclusions may apply. You will receive the contract before you are required to pay for GAP. You should carefully read the contract for a full explanation of the terms. If you choose GAP, adding the GAP fee to your loan amount will increase the cost of GAP. You may cancel GAP at any time. If you cancel GAP within 90 days you will receive a full refund of any fee paid. GAP purchased from state chartered credit unions in FL, GA, IA, RI, UT, VT, and WI, may be with or without a refund provision. Prices of the refundable and non-refundable products are likely to differ. If you choose a refundable product, you may cancel at any time during the loan and receive a refund of the unearned fee. GAP purchased from state chartered credit unions in CO, MO, or SC may be canceled at any time during the loan and receive a refund of the unearned fee.